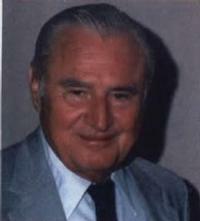 Dr. Hans van Ohain, one of the most honored American military researchers after World War II, died March 11, 1998. He was the inventor of the jet engine, which revolutionized the aircraft industry and led to the turbine engine which powers many helicopters today. He joined the Society's Dayton Chapter in 1988. As a 27-year old graduate in physics and aerodynamics at Germany's Gottinger university, Dr. von Ohain developed and built the first turbojet engine used on an aircraft. The formidable HeS.3B engine could fly an airplane at 500 mph, faster than anything then known and purpotedly two year ahead of flight testing of the jet developed in 1930 by Britain's Sir Frank Whittle. The first test flight over the Baltic Sea near Rostock on August 27, 1939 gave Germany a potential advantage and marked Dr. von Ohain's place in aviation history. In 1957, he moved to the United States, where he became chief scientist of the Aerospace Research Laboratory, and later, of the Propulsion Laboratory at Wright Field. Retiring from the Air Force in 1979, he joined the University of Dayton Research Institute as a Senior Research Fellow. He retired in 1992 and moved to Florida.